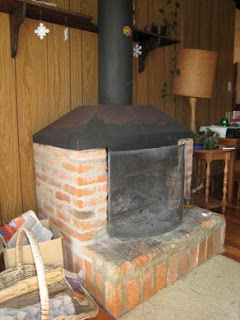 I wanted to share a picture of one of Brian’s favorite things in the house that we live in: the fireplace. “Now don’t you guys live near the equator?” Yes, Papua New Guinea is a tropical place, but we no longer live in the hot, humid coastal areas. We’re in the Highlands. The elevation of Ukarumpa is about a mile above sea level, on par with Denver, CO. Of course, it doesn’t get nearly as cold here as it does there. Most days here are pleasantly in the 70’s or 80’s, but it can dip down to the 50’s at night. And there’s this thing called acclimatization – once you get used to eternal springtime, 50 or 60 degrees seems really cold! So it’s actually nice to have a fireplace. We don’t light it all the time. We could probably live without it. But it is cozy to snuggle up on the sofa in front of the crackling fire when it’s a freezing 50 degrees outside.